By Christian Takushi, Macro Economist & Geopolitical Strategist – 26 Jan 2018 – Switzerland. As convergence and acceleration dominate the global geopolitical landscape, many political analysts seem to be confounded since the beginning of December. The US Administration is pushing its agenda on the Middle East and US Economy with great assertiveness. The White House is effectively building a US-Arab-Israeli Security Alliance to contain Iran and advancing also the conservative Economic Agenda with massive Tax Cuts and Deregulation. Many experts predicted that the alliance with Arab nations would collapse if the USA would recognise Jerusalem as the capital of Israel. That did not materialise as Arab nations seem more worried about the threat of Iran’s expansion and ballistic capabilities than the status of Jerusalem. Israel is silent on the security concessions it had to give to Saudi Arabia in order to avoid a collapse of the alliance. But the White House will be happy to see a close ally Israel taking risks to provide additional pre-emptive protection for Saudi Arabia in order to advance the new US strategy for the Middle East. Ryad is highly concerned about an Iranian ballistic attack and it depends on the USA and Israel for protection until it can deploy its own counter-measures. On both fronts, even US officials are surprised at the pace of the advance of the Trump-Pence agenda: The US-Arab-Israeli Coalition survived the recognition of Jerusalem as Israeli capital and Mike Pence’ historic speech at the Knesset last week. Meanwhile hundreds of US corporations decided to share the benefits of the tax cuts with their employees: Special bonuses of USD 1’000 to 3’000 were announced – After three decades of stagnant salaries in the USA and US corporations’ overriding preference for shareholder value, the move has surprised many critics and may be signalling an inflection point towards a slightly more equitable distribution of the economic rent. But, these two advances have come at a price: at many other geopolitical and economic fronts progress has come to a standstill or given way to deterioration. Assertive administrations like Ankara are taking advantage of the US’ total focus on Jerusalem and the US economy to advance their own geopolitical interests. Ankara moved heavy armoured troops into Northern Syria to attack Kurdish forces. And today President Erdogan gave the order to extend the offensive to the whole Turkish-Syrian border. The US passivity has exposed allied Kurdish forces, Kurdish civilians and even US special troops to elevated risks. Negotiations on the status of Dreamers, the border security, government funding and NAFTA lacked sufficient or effective support from the White House. While the government got funding for several weeks, other issues are stuck at difficult crossroads. Other geopolitical hotspots around the world experienced the same “downgrade”, allowing local and regional parties to take the initiative. One example is the Korean Peninsula. The President of South Korea disappointed once again Tokyo and Washington by going back to appease the North Korean dictator. Where diplomats see progress, military experts worry that the reward sends a dangerous signal to an emboldened dictator. Our independent assessment indicates that if the North Korean Olympic team performs satisfactorily on and off the stage – in promoting his regime to the world – the Winter Olympics will not be disrupted by the North Korean dictator. Consensus seems to consider North Korea the overriding geopolitical threat to peace, but we disagree – We see that risk elsewhere, specially the Middle East. Consensus says the Peace Process is practically “dead”; but we see a path for a new Peace Process and an ultimate Peace Treaty. Sadly, we don’t believe the coming Peace Treaty will secure peace, the contrary. We see war coming to the Middle East. These risks are under our continuous monitoring though. The lack of progress at multiple fronts shows that the current US administration still lacks enough manpower to handle multiple fronts. In that sense the Democrats can congratulate themselves for their impressive obstruction strategy on Capitol Hill. The downside of that success is that a large number of voters blame the Democrats for the government shutdown. 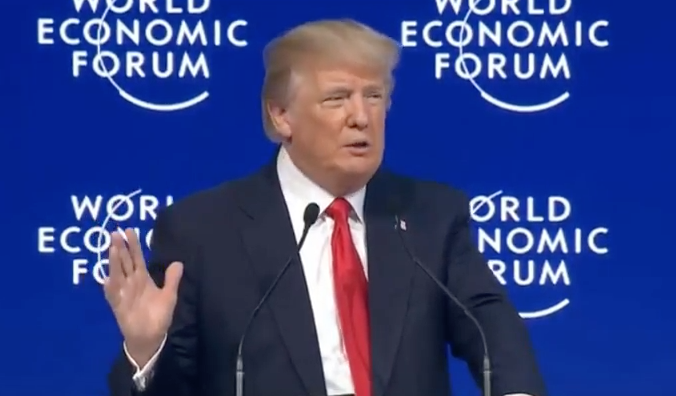 Seldom before have so many high ranking US government officials attended the World Economic Forum (WEF) and with such a strong message – As a result they have taken DAVOS by storm. Almost every other topic and national leader has been overshadowed by the US delegation and its assertiveness. This is not mainly due to President Trump, but the assertive participation of many US top officials: Treasury Secretary Mnuchin, Secretary of Homeland Security Nielsen and House Majority Leader McCarthy, Secretary of Transportation Chao among other US top officials spoke with boldness and assertiveness in support of the agenda of the current US Administration. The US delegation presented a resurgent USA with self-confidence and managed to keep the risk of a Trade or Currency War at bay. The US delegation will go home having secured the support of many business leaders. Not many of those leaders are eager to speak positively of the US administration in public though. The world of diplomacy, politics and media was taken aback by the US delegation. Consensus had become so obsessed with President Trump, that they had overlooked the fact that he is simply the leader of a broad and diverse conservative movement. They were also irritated by the warm welcome that so many European business leaders gave to the US delegation, including President Trump. Even those executives that don’t agree with some of Trump’s statements fully support his push against over-regulation and excessively complex taxation. They are investing aggressively in the USA and this has sent alarm bells throughout the corridors of power in Paris, Berlin, Brussels and even London. Not only are big firms moving investments to the USA, startups are moving to the USA. Our independent analysis is pointing since 2015 at the fact that the mix of Deregulation and Tax Cuts by the USA will expose the European Union’s biggest problem: Europe’s relentless increase in regulation and excessive taxation. The much criticised tax havens are in a sense a symptom of a wider problem and probably not the problem itself: European governments are becoming too big and taxing citizens & firms ever more. Thus, those that can flee do so. In many European countries the number of people working for the government directly or indirectly is reaching alarming levels. And this is not counting those working in the private sector, but riding the waves of government regulation. An alarmingly large number of people in the EU now depend on the government for their salaries, subsidies or pensions. As I have stated before, the Democrats and likeminded officials in the Department of Justice/Intelligence Apparatus may want to rethink their desire to impeach President Trump. If he steps down, Vice President Mike Pence would become President and the team he leads would pursue the Conservative Agenda with even more resolve and less distractions (i.e. far less tweets and mishaps) than Trump. Nine cabinet members would support Mike Pence in such an endeavour. DAVOS 2018 has shown to pro-globalisation elites that they are not dealing with a man, but rather a movement. Thus, they need to adjust their strategy. Whether leaders in Europe, the Middle East and Asia like it or not, one political event will drive the geopolitical agenda of 2018: The US Mid-Term Elections in the Fall of 2018. Early polling suggests it will be highly contested and many political analysts see the Democrats winning both the House and the Senate. Given the possibility of a loss of the Congress to the Democrats, we see already how the Mid-Term Elections 2018 are already shaping US Policy. The “all or nothing” effort to pass the Tax Cuts and Tax Reform through Congress (at the expense of neglecting other issues) and the increased tolerance for a weaker USD show that the White House is already completely focused on limiting the DNC advance on Capitol Hill. Top Republicans speak confidently, but their actions speak a different language: they know that in 2017 they messed up the overhaul or fixing of Obamacare. One of the many self-inflicted wounds. A large number of US political analysts see a DNC sweep in 2018 – and they have their good reasons to do so. The odds favor the Democrats. Still, our independent analysis has been indicating since Spring 2016 that consensus is underestimating the full potential effects of the Trump-Pence Conservative Policy Mix: deregulation, tax reform, tax cuts, re-militarisation etc. Econometric models can’t accurately simulate the impact as we haven’t had anything like this in forty years at least. Our latest analysis this January shows that consensus is still underestimating the full effects of the Policy Mix. Analysts are focusing on GDP and wage growth. But there is something about America and the American Dream those statistics can’t catch: the degree of a perceived change of direction, the degree of dynamisation of the US suburbs (those counties may tip the Mid-Terms 2018) and the many American Dreams this Policy Mix may unleash. A man may still be flipping burgers and earning a minimum salary, but unlike the past he may be dreaming of setting up his own business. As Secretary Elaine Chao said yesterday in Davos, America is exceptional. Such was the exceptional strategic foresight of the Founding Fathers – They designed a federal government that is counter-balanced and weak. That which upsets many analysts in Europe, Africa and Asia is at the very heart of America’s strength. Over the past 14 months Consensus has nearly celebrated the coming supremacy of China and the decline or retreat of the USA. So much so that Berlin no longer cares to hide her growing alliance with China and Iran. But if I can dare to make a prediction on the Global Balance of Power over the the next three years: Consensus in Europe has been too early in discounting the decline of the USA and the rise of China. I ascertain that the US economy is likely to surprise in a way that goes beyond the Dow Jones and GDP growth. 2018-2019 is likely to be a great challenge to many geopolitical and political analysts: The US economy will influence the course of geopolitical action or lack thereof. This preeminence of the economy in the political process against the backdrop of acceleration & convergence of geopolitical factors during the period 2017-2024 will be a source of disruptions and the interruptions of cherished continuities. While many experts see the USD in a downtrend, many of those disruptions are likely to lead to a higher demand for the USD. Soon the access to our research will be restricted – Only subscribers will have access. FED fails to normalize rates although zero rates cap growth and intensify deflation: watch USD!